For Dy Manager & Dy General Manager : Degree preferably in Engineering / Physical Sciences and 2 years Masters degree in Business Administration(MBA) or equivalent with specialization in Human Resource Management or MA (Personnel Management & IR) or MSW. For Addl General Manager : Degree in Engg/Technology with minimum of 60% Marks and MBA with specialization in Materials Management/ Production Management/ Operation Management/Supply Chain Management from a recognized institution/University or PG Diploma in Materials Mgmt. 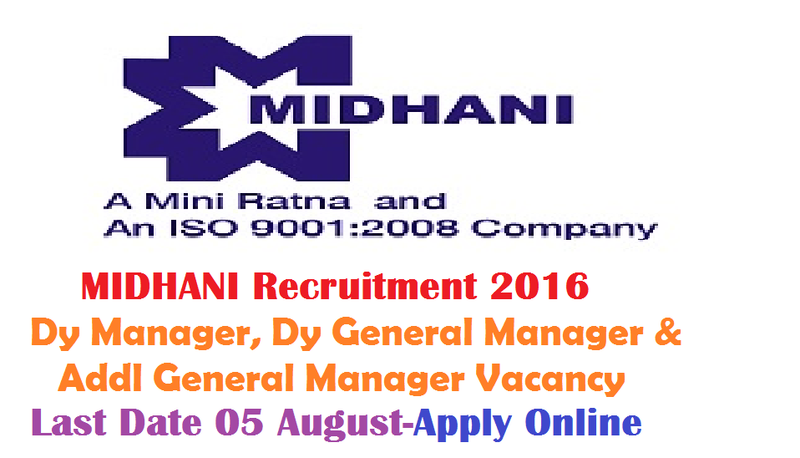 How to Apply MIDHANI Vacancy : Interested candidates may Apply Online through the Website http://www.midhani.gov.in/ from 23.07.2016 to 05.08.2016.